Health insurance is considered a must for everyone these days. However, there are still some people who did not take insurance at the right time and now fear that they are prone to illness because of their increasing age. Are you one of those senior citizens who still do not have any insurance and find regular health insurance policy beyond their affordability? Well, then this article would be of immense help to you. If you are still below 65 years of age, you can get a suitable and beneficial cover for yourself so that there is no stopping you from enjoying a relaxed retired life. The Insurance Regulatory and Development Authority (IRDA) have instructed insurance companies to set 65 years as the highest entry age for a health insurance policy. As per now, there are around 16 insurers in India that offer health insurance policies, so naturally there are many choices. However, if you have crossed 45 years of age the options starts getting limited gradually because many insurance companies refuse to offer new covers beyond this age. 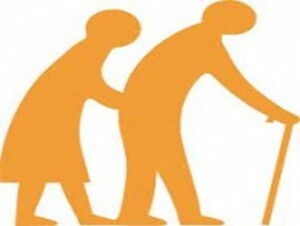 If you are above 60 years of age then you can easily opt for the customized senior citizens’ policy that is especially designed for your needs. Over the years the market for senior citizen health insurance has grown by leaps and bounds, and there are many companies these days that are coming up with useful plans. Remember that all the policies have their perks and downfalls so you need to be very precise about your insurance cover before buying a policy. If needed, you can discuss with your friends/family or reliable insurance broking companies that will allow you to compare different insurance policy at one go. No matter what the result is, taking a health policy for senior citizens is a great investment even though the premiums can be little higher. Hospitalization expenses incurred during an illness/injury. Pre- and post-hospitalization costs up to 60 days. Any disease that you contract in the first month after the start of policy. Certain diseases such as cataract, hypertrophy, benign prostatic hernia, and piles will be covered after1 year. Any expense occurring due to AIDS disorder. Existing diseases/injuries during proposing of insurance. Joint replacement surgery will be covered after four years. Mental illness or psychiatric treatment. Senior citizen health insurance becomes inevitability when you plan to retire and continue to survive on pension and life savings. You never know when a sudden medical emergency can drown you into financial crisis. In order to prevent this, it is sensible to take a complete senior citizen health policy. 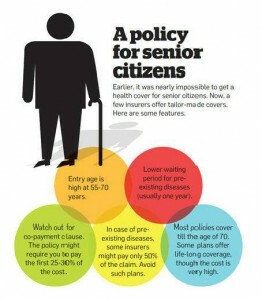 Most insurance companies in India offer health insurance for senior citizens and cater to their needs brilliantly. 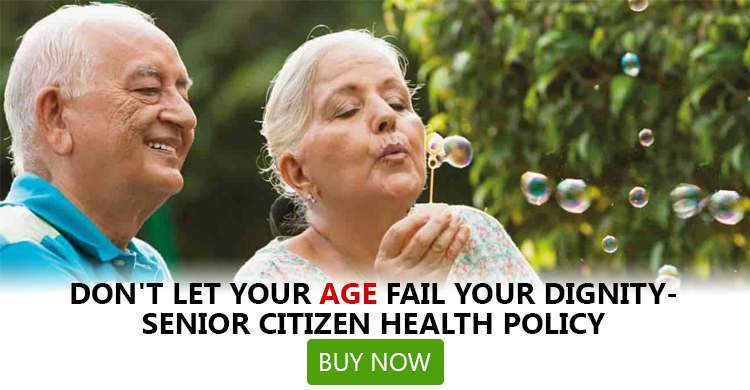 Some of the most popular senior citizen health insurance plans are Varistha Mediclaim offered by National Insurance, Optima Restore from Apollo Munich, Silver Health from Bajaj Allianz. Let's take a look at the features of these plans. National Insurance Varistha Mediclaim policy is aimed to keep senior citizen protected from hospitalization expenses and critical illnesses. This plan by National Insurance comes with features like co-payment, coverage for domiciliary treatment, ambulance charges, health check-up costs, optional cover for critical illness. National Insurance Varistha Mediclaim policy also provides cashless facility in its network hospitals. Apollo Munich Optima Restore plan comes with a unique Restore benefit. Regular features of this Apollo Munich senior citizen plan includes coverage for In-Patient Hospitalisation, Pre-Hospitalisation, Post-Hospitalisation, Domiciliary Treatment, Day-Care Procedures, Organ Donor expenses and the likes. Aside from the coverage on offer, this Apollo Munich health cover also provide a host of value-added services like Cashless Service, E-opinion, Health Check-up. Bajaj Allianz boasts a in-house claim settlement team. The coverage on offer by Bajaj Allianz Silver Health plan is for hospitalisation expenses, ambulance charges. This senior citizen plan by Bajaj Allianz covers pre-existing diseases from the 2nd year. Among the other features of Bajaj Allianz Silver Health plan includes, cashless facility, co-pay, cumulative bonus and many more. Prior to finalize any of the above-mentioned product, you should compare different quotes at GIBL to figure out which policy goes best in terms of price and quality. Ensure that you are monetarily protected in golden years of your life and can deal with the escalating medical cost.